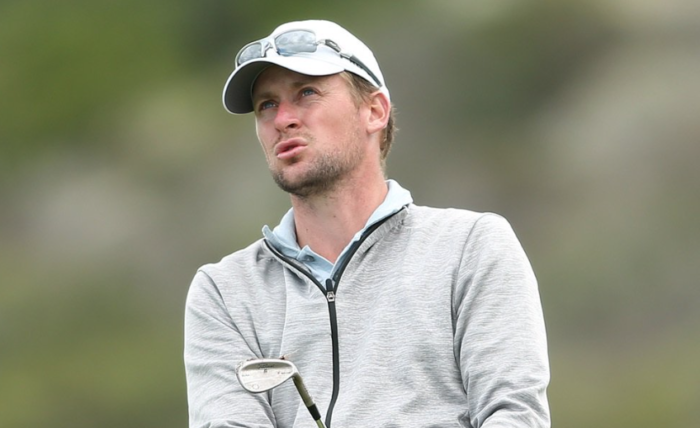 Jacques P de Villiers took his chances best on Thursday with a four-under-par 68 to share the lead of the first round of the VOG Final at Pinnacle Point in the Sunshine Tour’s first ever tournament at the spectacular course. He made five birdies and just a single bogey in his round to set the pace, Chris Swanepoel, who started his round later in the day, made seven birdies, but three dropped shots saw him sign for a matching 68 to join De Villiers at the top of the leaderboard. Not that putting was too much of a challenge towards the end of his round, as he closed with a pair of birdies. It’s been a tough season for De Villiers, with just two cuts made. Most often, that has been a product of a good round followed by a bad one, or vice versa, but his most recent cut saw him finish in a share of seventh in the Vodacom Origins event at St Francis Links in September. That good start might be of inestimable value, as the forecast for the second round includes winds gusting between 50 and 60 kilometres per hour. ‘The course was tough but fortunately the weather has been good,’ said De Villers. ‘It was pretty fair this morning, but tomorrow is going to be a bit windier, so we’ll see how that goes. I don’t mind the wind too much, but sometimes it can really get to you. I’ll just keep a level head and I should be fine. De Villiers and Swanepoel had a one-stroke edge over England’s Steve Surry, who three-putted the last hole on his way to a 69. There were seven players on two-under-par 70 including Jbe’ Kruger, Jacques Blaauw and Lyle Rowe.